~grease muffin tin (this recipe makes between 10-12 muffins) or line with paper cups. In a medium mixing bowl, stir together dry ingredients. Make well in center, pour in egg, milk, and oil. Gently stir until slightly mixed. Add a teacup full of berries and lightly stir them into batter. Spoon mixture into muffin tins, place in oven and bake at 400 degrees for about 20 minutes, or until lightly golden. Let rest in pan about 5 minutes then tip out over a wire cooling rack. Turn them over and sprinkle white sugar on top. Add a small pat of fresh butter. . . .and watch them disappear. I made these yesterday and ate one. When I went back to get another, they were all gone. I was disappointed until I found one half eaten on the floor of the livingroom, by Caleb’s choo-choo track. Was is bad that I ate it? jam mama. . . . I haven’t made jam for two years and I’ve been wanting to. Yesterday I got myself off the couch at about 11 and drove down the road to a fruit and veggie stand. I bought 4 quarts of fresh native strawberries that were just picked that morning, from a very nice country lady who was sitting with an old old lady behind the produce table. Then, we stopped at the grocery store to pick up a bag of sugar, a box of certo, and a case of jam jars. I got home, cleaned the kitchen, got all my things organized and made two batches of jam. A batch of strawberry and a batch of strawberry rhubarb. You should have seen small Grace diving into the warm cup of jam that I set out on the table, with a loaf of soft white bread from the bakery. She tore of big chunks of bread and dipped the majority of it down into the bright red jam. . . .there is just nothing like that warm, strawberry taste. . . .it’s heavenly. I woke up last night at 12:30 and Rich was not home yet so I called him. His plane had just landed, and he pulled in the driveway at about 1:30. I had the poor guy up at 5 this morning. . . .needless to say, he’s tired but we’re about to go out with the kids and have fun. It is so good to have my husband back home! That strawberry jam looks deLICious! I don’t think I’ve ever made jam by myself before; I can’t wait to do it some day.YAY for Rich being home. I guess he’ll be good and ready for a nap this afternoon…maybe when you feel your own “sleepy spell,” you can both crash together! did you buy that cookbook? I LOVE it! 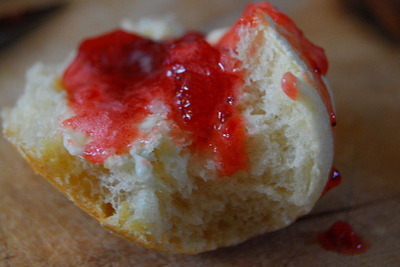 such a pretty picture of your Jam! I am going to go pick blueberries today for a batch. Have a great day! I’m so glad for you that your husband is home…I know how it is to breath that sigh of relief when your family is all with you! 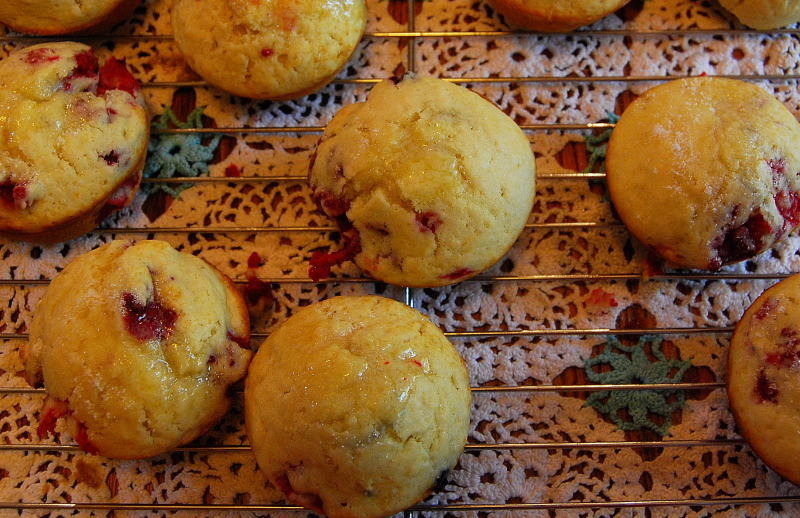 I don’t think it’s polite to post recipes and delicious looking muffins and jam pictures early in the morning before I’ve had a chance to eat anything – not unless you have put some on a plane headed to Oklahoma City! LOLEverything looks WONDERFULLY yummy! Glad your happy family is complete again! Welcome home, Rich! Yummy looking post, jam mama! :)Enjoy the time with your sweet pea and the littles. Good Morning Shanda…..The muffins look delicious. I will have to try that recipe. Now that my oven is working. How convenient…..a fruit and vegetable stand down the road…… 🙂 People come from British Columbia with their fresh fruit and set up stands around the city. I’ve only seen 3 so far. Jam – Mama….cute. Have a wonderful day with your family. Mmmm, you’ve gone and made my mouth water. Enjoy this Saturday with your husband! I am glad Rich is home. Hopefully the two of you will get a nice Saturday afternoon nap! My hubby gets home tomorrow, I can’t WAIT! Yeah Rich is home! Happy for you! The jam looks excellent. I still have not tried to make jam but have wanted to. Some year. I hope you have a great weekend! I’m going to eat lunch and read the rest of my book then I’m going out in the sun to get chores and enjoy the blessing of a day that it is! I would have eaten the leftover muffin too LOL! That jam looks awesome! I just bought a canning set that I’m waiting to be delivered. This is such a yummy post, Shan! Everything looks sooo good! I’m glad that Rich is home- have a wonderful Saturday with your whole family! LOL! Jam mama! You’re pictures are lovely, too! I have company coming next weekend…maybe we’ll have some blueberry muffins for breakfast one day! Those muffins look scrumptious!! I think I may have to save that recipe!! Thanks for sharing! @Hutch5 – I just used the recipes included in the box Certo. I do cooked jam because I prefer seeing it in a pretty glass canning jar. But, my mom makes freezer jam and she likes the fresher taste. The directions for both types are included in the Certo box. (I bought mine in the seasonal aisle at the grocery store.) Try it! It’s not as nerve-wracking once you’ve done in a couple times. I’m addicted now. I just got done making red raspberry/strawberry jam, and I plan on making peach eventually, when our peaches here are ripe. Thank you for posting the muffin recipe!! I’m going to get some fresh berries so I can make some! It sounds so good. Oh, and I would have ate the muffin to:) The jam sounds good to. I made some 3 years ago, and haven’t made it sense then. I like the homemade taste of it, it didn’t last long around our house:) Glad Rich is home with you! Have a great evening! 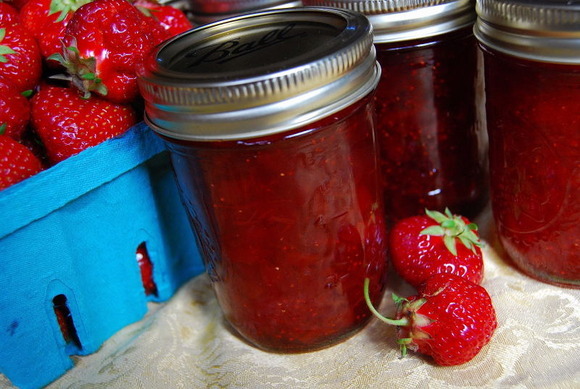 There’s nothing better than homemade jam. My MIL always makes raspberry jam, but I want to try my hand at grape jam at some point. I’m glad you had a nice day and that Rich is home safe and sound. Your posts are just delightful – I’m so glad I found you! (I can’t remember from which friend’s site I bounced to you…?) Your children are precious, and you seem to have such a loving, close family. God’s blessings on all of you, and on your new little one. OH, that Jam! I can hardly take looking at it! I wish I could reach through the screen and grab a jar of it! Yummy! I have been craving home made jam! What an undertaking!! It does look wonderful! Good job Jam Mama! :o) Hahaha! those muffins look emmm so good and the jam – luscious! do you have a good recipe for your rhubarb jam? i’d love to try it, down here we love peach jam – it keeps that fresh peachy flavor if frozen. looks like you had a succesful day, i love the jam mamma, so cute – you go girl! Thanks for posting the recipe. It all looks so yummy! !